You might have noticed it on your restaurant bill, and maybe not at another place you visited... it's that 2-5% fee tacked-on to your meal. 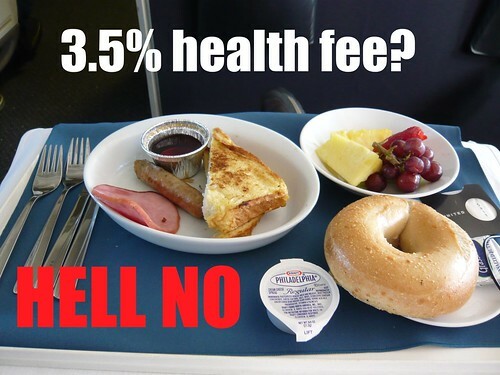 Restaurants call it a "health fee," others call it a "health surcharge" and others call it a "health tax." It's really confusing, ain't it? Since the City and County of San Francisco requires all employees to have some form of health insurance, some city restaurants decided to get all whiny about it by charging a percentage surcharge to every bill. Others have decided to obey the law by not offering a percentage surcharge and may simply just absorb that cost or just revise the prices on their menus. Today, I'm going to target those pesky restaurants who sneak in that little surcharge. It must be clearly noted on every single restaurant menu (even if it's in small print). That's called informed consent; you have a right to know of any additional surcharges being tacked on, other than the sales tax. This is similar to the 18% gratuity charge for parties larger than 6 people and must be clearly noted on the menu. The restaurant must clearly note this charge on their receipts. Can it legally be called a "tax" on the receipts and/or menu? For the consumer, it's pointless which phrase/word(s) used because you pay the same. But in a legal standpoint, it can be risky to call it a "tax" as it is only used for a government collection purpose. How is the health percentage charge applied? Here's three possible examples of potential problems: (1) Using the subtotal, calculate the health percentage and the sales tax separately; add them together for the grand total. (2) Using the subtotal, calculate the health percentage, add the two together, and calculate the sales tax. (3) Using the subtotal, calculate the sales tax, add the two together, and using the new total, calculate the health percentage. California State University students pay "fees" but not "tuition" since California residents get their education tuition-free; legally, CSU campuses cannot use the word "tuition" unless the student is not a legal resident of California. Here's an example of a restaurant that calls their health percentage charge a "tax:"
McCormick and Schmicks in San Francisco charged my gift card a "SF Health Tax" of 62 cents, and this was calculated by using the subtotal of my food and beverage cost (pre-sales tax) and adding 3.5%. The sales tax was calculated using the food and beverage total (not including the health percentage charge) at 9.5%. I don't like these health percentage charges. It pisses me off when I'm being charged extra when I get my bill and they could have easily sneaked it into their menu by just charging a couple of dimes to the prices (or using cheaper ingredients). It's like the airlines advertising great fares, but not including the $20-$35 fees until you start booking it online. Legal note: I am not a lawyer or attorney. This is not legal advice. Consult with a lawyer, city attorney, district attorney, or someone with a law degree for help. I may sound like some kind of lawyer, but I'm not one... I'm an Administrative Assistant. when I was a waiter ( now PC Waitstaff), It was assumed that : my wage was lower, my level of service produced the tip, and that I bought my health Ins etc. A good tip then was 10%+. IRS let me report my tips. Today IRS says employer must report my sales and assume 8% in tips. Tip range today 15-18%. Some people pay on net before taxes-some on full bill. Since I now receive Health-from surcharges, a patron should deduct that amount from the tip . Once they catch on it will start to happen. At The Cheesecake Factory, I saw the 2.5% fee added. It stated this fee was in response to SF's health laws. I asked the employees if this 2.5% was set by the city or if the 2.5% was added as a choice by The Cheesecake Factory to cover the cost of the city's law. The told me that it was required for them to add it by the city. This is a lie, right? It's not a city fee, only the restaurant can add this fee. The percentage could vary , depending on what health plan the establishment pays for. The city requires health care depending on how many employees work there, but the add-on percentage could be done or they may raise prices to compensate.